Bronwyn Holloway-Smith who is researching the whereabouts of murals crafted by the late artist E Mervyn Taylor. Part of the mural work Te Ika-a-Māui is pictured in the background. Massey University’s College of Creative Arts is embarking on a quest to honour the memory of New Zealand artist, craftsman and designer E. Mervyn Taylor by undertaking a search for the thirteen known murals he created between 1957 and 1964. A publicity appeal for information about the other missing murals, and a campaign to help rebuild and restore the artist’s surviving work, amid calls for a register of all artworks of the era located in public buildings, is being launched by project director Bronwyn Holloway-Smith. She is currently in the process of helping restore one of the few surviving murals. The ceramic tile mural depicts Te Ika-a-Māui, the story of Māui fishing up North Island. It was commissioned by the New Zealand Government to mark the 1962 completion of the Tasman leg of the Commonwealth Pacific Cable (COMPAC) – a huge underwater telephone cable system that connected New Zealand to its Commonwealth allies in the aftermath of World War Two. The mural was originally housed in the COMPAC landing station in Auckland. The mural was discovered in 2014, stored in cardboard boxes, as a result of Ms Holloway-Smith’s PhD Research into the history of the Southern Cross Cable – a cable that COMPAC paved the way for. 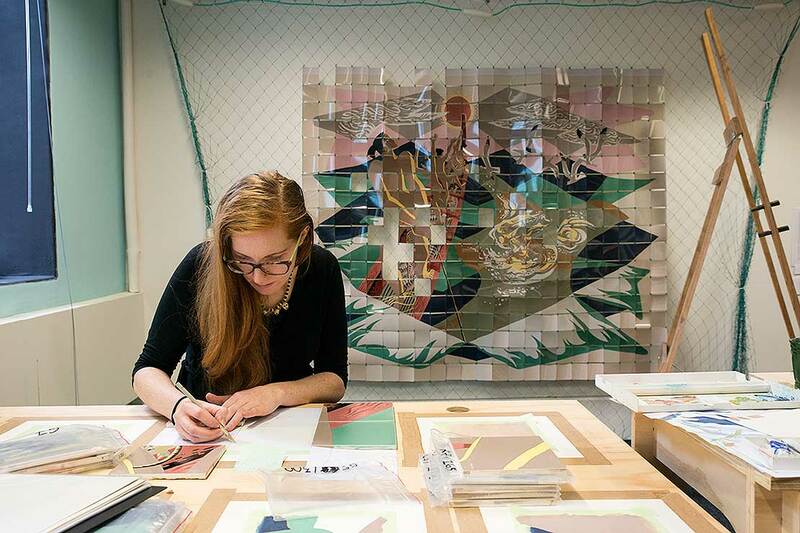 Since then she has led efforts to meticulously clean and digitise the work, and has made colour-matched, full scale gouache paintings to fill the gaps left by sixteen missing tiles. The mural is now being returned to Auckland for its full restoration. E Mervyn Taylor, who studied at Wellington Polytechnic - a forerunner of the College - also used carved wood panels, sand-blasted glass windows and paint to create his distinctive works made at the end of his career. He was also known for his sculptures, painting and illustrations, and devoted his life to moving beyond colonial perspectives to create a distinctive South Pacific way of seeing the world. That ethos is captured in the 13 large murals and building decorations scattered throughout the North Island including some still in their complete state at the Khandallah Presbyterian Church and the Otaki War Memorial Hall. The state and whereabouts of other murals remains unknown. “Currently we have identified five works which are missing and potentially lost, two that are currently hidden - whether partially or fully, and six that are in good condition,” Ms Holloway-Smith says. “Members of the public, former building owners, people who worked in or visited the buildings, or architects and designers who have been involved in refurbishments over the years are all people who might know something about the fate of these works,” she says. As the College of Creative Arts commemorates its 130th year in 2016, staff led by Ms Holloway-Smith as project director, are dedicating work to the research and recovery of Mr Taylor’s abandoned murals. “His work provides us with a fresh perspective on New Zealand history that hasn’t necessarily been protected, but is essential in ensuring a more accurate understanding of what we represent as a nation,” she says. To capture Taylor’s distinctive language of art and design, Ms Holloway-Smith is researching, cataloguing and documenting the status of each mural. “As an artist myself , it breaks my heart to think that these remarkable works – many commissioned for the people of New Zealand with public money – could have simply been lost and forgotten if the College of Creative Arts hadn’t taken the initiative to step up and support this project,” she says. College of Creative Arts Pro Vice-Chancellor, Professor Claire Robinson, says, a key part of the project is to raise awareness of the need to better protect and promote New Zealand’s public art heritage. “Part of the project will be not only seeking information about the missing Taylor artworks, but to form a list of other lost works of the period and begin a register of significant works that need protection,” she says. Taylor’s murals and building decorations were all completed for sites throughout the North Island. One mural has been anecdotally reported as being at the St George Hotel (cnr. Boulcott and Willis Sts, Wellington). No further records of this work have so far been located. 2. Please use the same contacts above if you would like to register other significant works of public art that might already be lost or need protection.